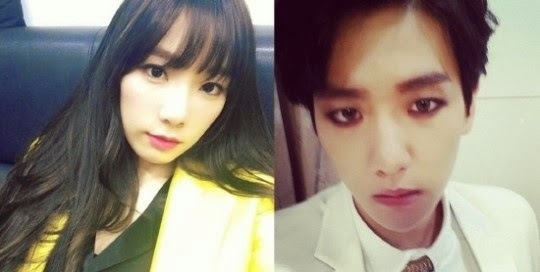 In 2011, EXO’s Baekhyun became a trainee of SM entertainment and met Girls’ Generation’s Taeyeon for the first time. Taeyeon was a top k-pop star, and she gave helpful advice to Beakhyun who was under hard training. He had to make a debut as a member of EXO after going through relatively short training period, and of course, he had difficulty catching up with the other members. So, as label mates, they could get closer and closer. And according to Taeyeon’s acquaintances, she likes a man who is witty but professional about his work. Well, yeah, that is Baekhyun. Taeyeon and Baekhyun met very secretly. They usually had a date at dawn to escape public gaze, while only a few of people in SM Entertainmnet knew about their romantic relationship. Although they had to manage a series of tight schedules as top k-pop stars, they made time to go out together. They usually enjoyed their date in Taeyeon's Mercedes-Benz SLK55 AMG, while Taeyeon picked Baekhyun up and visited a public parking lot nearby EXO's accommodation. And they sometimes went our for a long-distance drive. Taeyeon called Baekhyun "Baekeong" or "Baekung", while Baekhyun called her "Taenggu." Actually, the two stars' relationship was not a surprise news for some of their fans because they used couple items for their T-shirts, bracelets, headphones and sunglasses. They also had been spotted cozying up on the stage. They talked in whisper and touched each other in a friendly way. After Taeyeon and Baekhyun admitted to being in a romantic relationship with each other, Taeyeon apologized to her fans through SNS. Here’s Taeyeon’s letter to Sone. Sone, I know you guys were so surprised and got hurt because of me. I'm sorry I made you feel such a emotion that you would not need to feel. I really want to apology to you for what happened today. I was not careful enough. I'm really sorry I hurt your feelings. I think you may be disappointed, upset, irritated, abesent-minded, etc. I can accept that. It may be just me, but I think you loved me, believed me, and cheered for me that much. As of now, some of you may misunderstand me. But I'm not trying to seek clarification. I just want to say something about Instagram. I was never meant to make fun of fans by posting meaningful pictures on Instagram.